To save someone’s life, you will need to apply CPR. These couple of minutes could mean the difference between life and death. We all know that sometimes when a car accident happens, patients are usually in a very strange position. If you move them, you could kill them. This course is all about moving your patient in a safe way. It is a very risky situation because you will need to be trained. One false move and you can poke a vein or something worse. That is why we pay a large amount of attention to this type of course. As always, you will need to know how to determine if a person is alive. If you want to test the knowledge you have, you can always try with our courses. We will teach you some things that you weren’t taught in you medical school. These medical courses will help you with you to fill your knowledge and to give you a practical approach. This will be a sort of practice for you. His job is to make sure that all students understand the importance of CPR. This can save someone’s life. 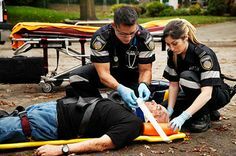 As an expert and a paramedic employee, Mike will give you all the necessary explanations and how to systems. As an expert in nursing, she will tell you how to inject all sorts of instruments into a patient to help him.